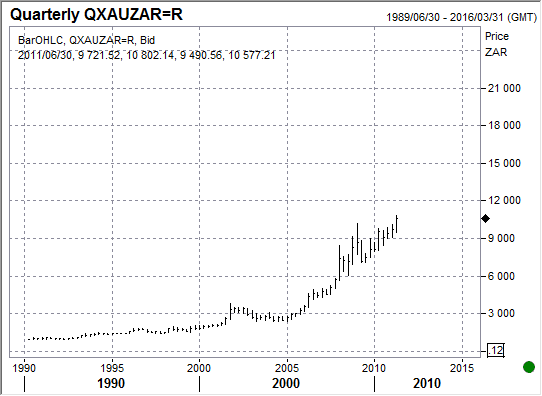 Just referring to the discussion in the comments section of the post “One more reason to own gold,” here’s a chart of the Rand price of gold (XAU-ZAR). Bokkeman, this is for you. This shows that the Rand is collapsing, just as other paper currencies are. As long as people, and particularly professional investors who all still mock gold as an investment, don’t understand why the price is rising and have a laugh at so-called gold-bugs, it is pretty obvious that we aren’t in the explosive mania phase of this gold bull market,,, yet. Just because the rate of increase in rand terms has slowed down in the past two years, doesn’t mean it won’t catch up to dollar and euro priced gold rates of increases again in the future. From 2005 to 2009, the rand gold price rose faster than the dollar and sterling gold price, now the tables have turned for a while… but rising, it sure still is! PS. Also see this post for more charts. Thanks. I realise we’ve seen steady growth in the rand value of gold, but I’m trying to understand what would happen (in rand terms) with the so-called currency collapse. Now from my limited understanding in currencies and their vagaries, it seems that a currency can never collapse EXCEPT in terms of another currency (or basket of currencies). Absent gold standards for any currencies there is no absolute, objective measure of value, so the only way a currency could be said to “collapse” is if its value would go way down relative to a specific other currency. If we were to experience global currency fluctuations, then what form do you expect that to take, in the light of the above? If anybody predicts say a dollar collapse, would it then not be collapsing against other currencies, e.g. emerging market currencies, e.g. the rand? And in which case the dollar gold price will skyrocket – but the rand gold price will remain stable. Or do you expect ALL currencies to “lose value” simultaneously, measured by the meteoric rise of the value of gold in ALL those currencies. But, again according to my assumptions above, would the relative exchange rates of those currencies then not remain more or less stable? Under what circumstances would something like this happen, i.e. exchange rates all remain stable but the gold price rises in all currencies? Hi Bokkeman, freeman here. Some good questions. This is not true. When a currency collapses its value collapses against EVERYTHING else. Currencies are not only valued in terms of other currencies but in terms of all things they trade with/for. There is no doubt the dollar will collapse SOONER than the rand, but the rand will collapse, as every fiat currency in history eventually has. The rand lost 90% of its value since 1990 while the dollar has lost 96% of its value since 1913. So the rand, since the 1980s, was collapsing faster than the dollar, hence the attractiveness of buying gold with rands. You are right in implying that if the dollar collapses and other currencies maintain relative strength against the dollar, then the price of gold in those currencies won’t rise as fast as it will in dollars. Indeed, there will be periods of price stagnation of gold in those currencies, as we have seen in SA over the past 3 years. However I would add two crucial points to this: 1) The point is that as all currencies are being debased (albeit at varying rates), gold offers you protection against price inflation in that currency. 2) As the dollar collapses, the need for a global reserve currency arises. We believe without doubt that will be gold, meaning that the gold price will not only rise in proportion to the dollar’s collapse, but will rise faster than the dollars depreciation as it supplants it as the global medium. This means gold should get more expensive in rand terms even if the rand is appreciating against the dollar. All currencies can and do AND are losing value against gold while exchange rates remain roughly stable. This is exactly what is happening with the EUR, USD, GBP and JPY. Gold price is rising and reaching record highs in all these currencies while each currency looks “stable” when priced in the other currencies!!! It is a classic case of the wrong benchmark deceiving everyone. Many think these major currencies are stable when they are far from it. The analogy would be comparing your intellect to the dumbest kid in the class every year, and concluding that you are doing well because you are keeping up with him. Meanwhile the rest of the class is way ahead and leaving you behind. It all depends on your point of reference. So to sum, you ARE RIGHT in saying that the rand gold price is likely to rise slower than the dollar gold price. But one has to understand that all fiat currencies are being steadily destroyed, and that gold the fundamental protection against this. This really is the bottom line.